Theresa May will put her Brexit deal to the House of Commons later for a second "meaningful vote" as she seeks approval for her updated plan. Last time the prime minister put her deal to MPs, she lost by a historic 230 votes. What support does Mrs May need to ensure her Brexit deal passes tonight? The magic number of MPs the prime minister needs to back her deal is 318 - that is if everyone who can vote does so. When MPs voted on the deal in January, 432 voted against, but 202 voted in favour. That means, if there are no abstentions from the vote later - when an MP does not vote either way - Mrs May needs to convince 116 more MPs from any side of the House to change their minds and support her. There were 118 Tory rebels who voted against the deal last time, but three of them - Anna Soubry, Heidi Allen and Sarah Wollaston - have now left the party and joined the Independent Group, who are expected to vote against the deal. So even if Mrs May persuaded the other 115 Conservative rebels to toe the party line, she would still be one short of securing her deal. 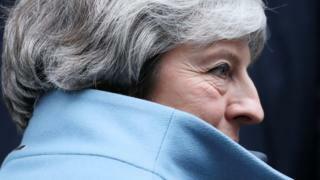 The PM may have been hoping to convince the 10 members of the Democratic Unionist Party - her confidence-and-supply partners in the Commons who, in normal cases, give her a working majority - to change their minds and vote for a deal. But earlier, a statement from the party confirmed they would be voting against it. There may be hope for the PM from the Labour benches. Although the party's leader Jeremy Corbyn has said he and his MPs will vote against, it is thought some have been convinced to back the deal and vote in favour. This could cancel out the need for DUP votes to get it through, but only if there are no Conservative rebels. And here is where the European Research Group - the Conservative Brexiteer backbenchers who also voted down her deal in January - could come into play. We are still waiting to hear from some of the major figures in the group on which way they will go later. But a number of members have already rejected the deal, meaning the PM is unlikely to get a clean slate from her own benches. We will know shortly after the vote at 19:00 GMT tonight whether the magic number has been reached or not.